A favorite and classic Italian Sausage Lasagna Recipe with Italian sausage, tomato sauce, ricotta and mozzarella cheese is very easy and delicious. With a small salad, this lasagna recipe makes for a great meal. For many people, lasagna is real comfort food. 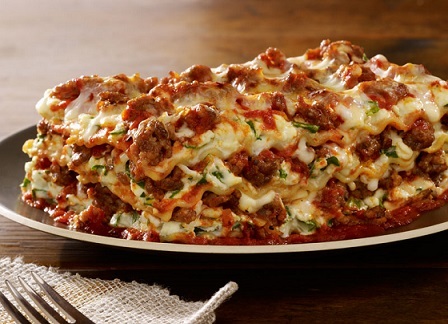 Lasagna noodles are wide pasta and usually rippled in North America, but most often flat in Italy. Lasagna is also the name we give to the casserole made with alternating layers of lasagna noodles, sauce, vegetables, cheese, and often meat. Lasagna is a favorite casserole or pasta dish at potlucks and a wonderful dinner at home anytime. Lasagna speaks to the tradition of sharing a meal. Lasagna recipes are simple or complex. Lasagnas have a great deal of flexibility - so you decide. Try different ones, experiment and have some fun! Preparation time: 45 minutes for cooking the sauce and pasta. Baking time is 65 minutes with a standing time of 10 minutes. Serves 8. Serve the Lasagna with a side dish of freshly grated Parmesan cheese for the perfect added touch. This lasagna recipe may be frozen for up to 3 weeks (without the shredded Mozzarella on top). Simply thaw in the refrigerator and bake as above. 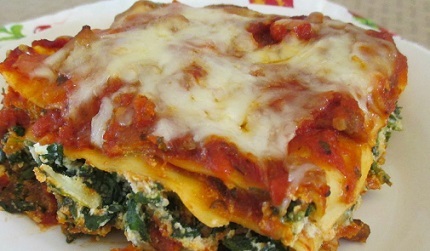 Enjoy your Italian Sausage Lasagna with Spinach and the company of those you share it with! "Today I will be as useless as the "g" in lasagna."